Each year at HBS, we conduct focus groups with students around their application/decision process. In early 2014 we heard from many students that they wanted to “see what life was like at HBS” while they were making their decision to see if they could see themselves in the MBA program. The #LifeatHBS campaign is an effort to showcase in an authentic, unfiltered way what it is like to be at Harvard Business School through the posts and photos of students, staff and faculty who go, work and teach at HBS. The campaign was launched by our Admissions Director doing direct outreach via email and I provided direct social outreach through our Twitter handle. Photos are aggregated by hashtag on our Social Media photos page. 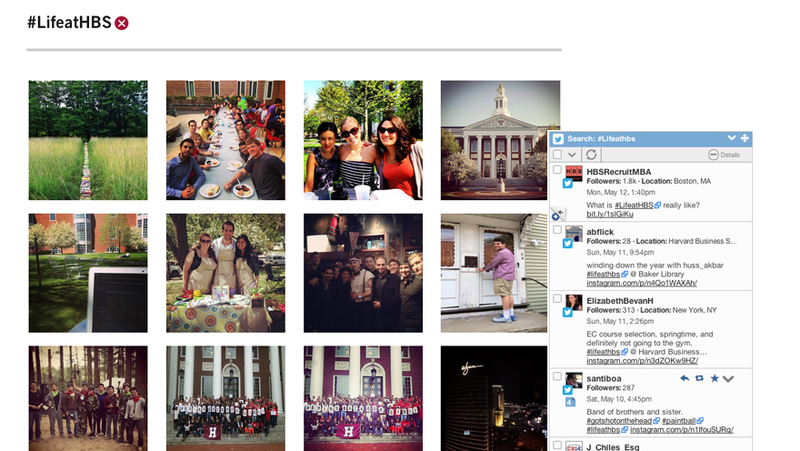 Tweet & photo streams, curated video and student perspectives also appear on the Student Life page.